I think (I hope I'm not the only one) all sewers go through a phase where they think fabric baskets are cute and the solution to all kinds of organizing woes. I've tried a few versions but I never like the results. The One Hour Fabric Basket has been floating around instagram for a while, and I decided this Christmas I was going to give it a whirl. I went to craftsy.com and got the PDF version, but there is a tutorial here as well. My first quest was to decide on fabric. I've had some Bruins fabric for a while that never seems to be right for what I want to do. It's just a cotton, very flimsy. And I soon found out the error of my ways. Stay tuned. The directions suggest fusible fleece as the interfacing, so I found some at my local Joann Fabrics and got to work. The first thing I did was set the timer to see if it really was a 1 hour basket and I am here to tell you that indeed, it took me an hour and 1 minute to make my first one. This was with a lot of hemming and hawing before cutting, so I wasn't working super duper fast. An experienced sewer can definitely do it in less than an hour. I chose another cotton for the lining and made the first one just like the directions said to. I didn't quilt it or do anything different because I was on the clock and because I didn't want to do anything special if it wasn't going to work out. Other than my ridiculous decision to make the opening too small to easily turn everything right side out (another few minutes eaten up with the turning process because the opening was too small) it went really well, just like the directions said. But, because of the thin fabrics and the fusible fleece not being super sturdy, I wasn't in love with it. It was just like it was supposed to be, very easy to do, but I always want sturdier baskets. So, I decided I needed to get something more heavy duty for interfacing and used home dec fabric. Last year, I scored a huge haul of home dec fabric from someone at school and I thought this would be perfect for baskets. Until I started using the fuscia on the inside and discovered that it wasn't home dec, just something stretchy. Not really the best way to make my baskets stand up straight. 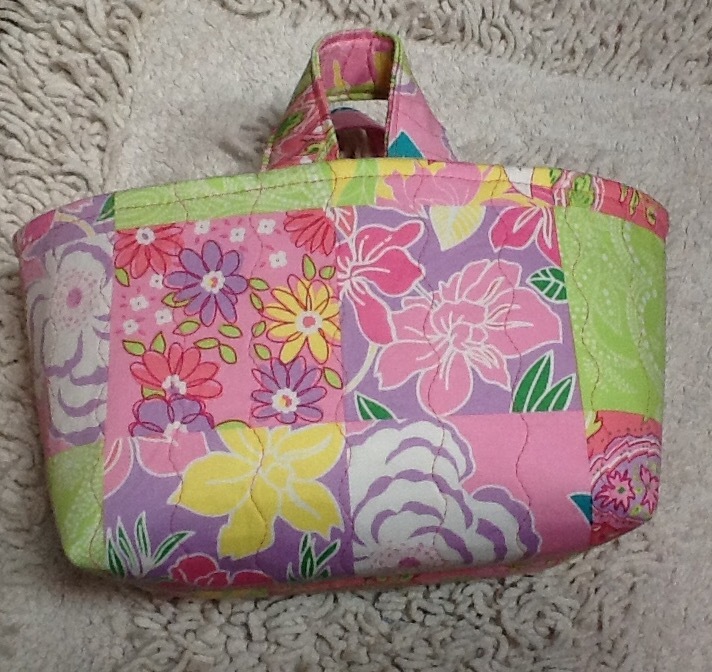 For this one, I wanted to put the handles in a different spot, kind of like a purse. I wanted to see what it would look like and I thought it might feel more like a bag that someone would want to actually carry. I also wanted to get fancy and do some quilting on it before I put it all together. The handles are something we shouldn't talk about, but the bag part is really nice. I was going to do my famous wavy quilting, but I thought maybe actual diagonal lines would be better. And they were until they started curving. So then, my lines became somewhat swirly and I kept the pattern going, so I think it came out great. I was concerned that where the two pieces match up, the quilting wouldn't match, but it's really no big deal and only a highly qualified sleuth would be able to notice it. So the handles.... I thought it would be a nice touch to quilt the handles. But I did it in the most unprofessional way, so there are threads poking out no matter what I do. And it's too late to take them all out and go with plain handles. And eventually, they will all just work their way out anyway. On to my favorite one. I liked the placement of the handles in the middle instead of the end and after the handles debacle with the last basket, I knew exactly how I wanted to quilt the handles and make it work. I found a very heavy Pellon that you can fuse on one side and it will stand up better than the fusible fleece. It still isn't quite as stiff as I'd like and I did find one that was fusible on both sides and extremely heavy duty, but I was worried my machine might not sew through it or that it might poke through the fabric at the corners. 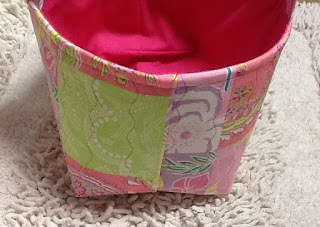 I put a strip of the new interfacing in the handles and didn't sew them closed until I had quilted. That's what makes the different. A big DUH moment for me. And then, after such a nice job with the handles, I sewed the ends too close together. Homemade means you have to leave a little something to remind them that it's not from a factory, right??? I did the wavy quilting on the outside and it was much easier to deal with than my diagonal lines on the previous basket. There are lines on this fabric, so I realized it might make the waves harder to get away with because they might not be precise enough but like how it came out. For this one, I used that stretchy non-home dec fabric from the other bag as the lining fabric. I thought the stiff Pellon inside would be enough to give it sturdiness. It does, but again, I would like it one step stiffer. I need to stop using that stretchy fabric. It stands up really well, but I guess I want these to be bags that you can carry around and it bothers me that the bottom pulls down when there is weight in it. This is not the design's fault, it's entirely my expectations. I thought the pattern was fantastic to follow, very well written with great pictures on the PDF. I did not use the website link at all because I got everything I needed from the PDF, but a quick glance at the website tells me you could follow it really well there. My new plan is to make the next basket higher and the straps longer so it really can be used as a bag. I have the heavy fabric picked out and ready to go! This was the first time I've used a pattern from craftsy and I really liked it. Plus, it was free to members, so that was a nice bonus! Your baskets are so pretty.